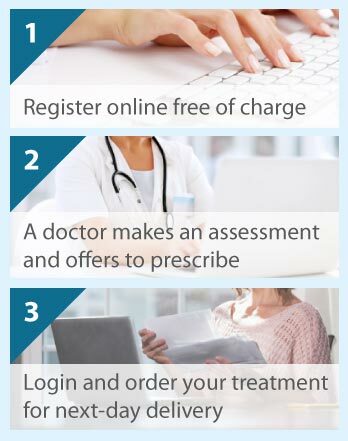 The Online Clinic can perform an assessment online free of charge and prescribe treatment if you have had a positive test result for H. pylori. If you have not had a positive test result, we can provide a postal test, with results in 2 days. Helicobacter pylori, abbreviated to H. pylori, is a bacterium found in the stomach. Infection is thought to occur through mouth-to-mouth contact or consumption via hands, food or water contaminated with stools. The bacteria enter the stomach lining, causing the release of agents that activate the body’s immune system. This leads to inflammation of the linings of the stomach (gastritis) or of the duodenum (part of the gut attached to the stomach; duodenitis), which makes the stomach and duodenum susceptible to further attack from stomach acid and digestive juices. Signs and symptoms will indicate the need for testing for H. pylori. Most people with an H. pylori infection have no symptoms and do not develop problems. However, H. pylori can cause gut problems, such as gastritis/duodenitis and peptic ulcers in the stomach or duodenum. Symptoms of an H. pylori infection include pain or discomfort, bloating, poor appetite, nausea/vomiting, anaemia, and blood in stool or dark-coloured stools. H. pylori infection is regarded as an important risk factor for stomach cancer, as a result of abnormal changes in the stomach lining caused by long-term gastritis. There are several tests for the detection and diagnosis of H. pylori infection, which can be invasive (based on a procedure known as endoscopy) or non-invasive. Testing is not usually carried out in people with no symptoms, no previous peptic ulcer disease, and no active ulcers. The most widely used non-invasive tests are the stool antigen test and the breath test. Stool antigen tests detect H. pylori proteins in a stool sample. These proteins act as antigens, i.e., substances that are alien to the body. The body’s normal response by its immune (defence) system to an antigen is to produce antibodies to bind with, and thus counteract, the antigen. Stool tests use antibodies to bind with H. pylori antigens, enabling the antigen-antibody complexes to be detected by a colour change in the prepared stool sample. This simple test can be used for both H. pylori diagnosis and monitoring after treatment. As a stool sample only is required, the method is especially useful for children. Breath tests, called urea breath tests, require patients to swallow a solution containing urea labelled with carbon-13 or carbon-14. If present, H. pylori uses the enzyme urease to convert urea to labelled carbon dioxide in the stomach. Labelled carbon dioxide then passes into the blood where it is transported to the lungs and can be detected in exhaled breath using special laboratory equipment. Blood tests are based on the detection of anti-H. pylori antibodies produced by the body's immune system in response to the bacteria. Blood tests are only of use if the person has not previously received treatment for H. pylori. Endoscopy involves insertion, through the mouth and into the stomach/duodenum, of a hollow tube with a light and camera at the end. Examination of the images projected onto a screen can be used to detect any abnormalities, such as gastritis and ulcers. Tools can be inserted down the tube enabling collection of tissue samples for further testing. Generally, people with H. pylori infection who do not have symptoms will not be treated; those who have symptoms, previously had peptic ulcer disease, or have active gastric or duodenal ulcers should be treated. Treatment is based on antibiotics that kill the bacteria combined with an antisecretory medicine that reduces the production of stomach acid (and so prevents gastritis and ulcer formation) and enables damaged tissues to heal. Reducing the acidity in the stomach is necessary for the antibiotics to work effectively. Commonly, the treatment strategy is triple therapy, as three drugs are used. One antisecretory medicine known as a proton pump inhibitor (PPI; e.g., esomeprazole lansoprazole, and omeprazole) is used with two different antibiotics, clarithromycin (or metronidazole in clarithromycin-resistant strains of H. pylori) and amoxicillin (or metronidazole in cases with penicillin allergy), taken for 10 days. Treatment failure, which potentially results in antibiotic resistance, is potentially lowered by using two antibiotics. A test for H. pylori after treatment will confirm clearance of the infection. People who still have an H. pylori infection may need further treatment using different antibiotics. Antibiotic resistance is of growing concern; thus, it is very important that all the medicines are taken as prescribed and that the individual has a follow-up test.